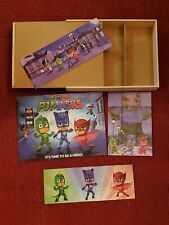 PJ Masks Puzzle Set in Wood Storage Box - Just like NEW! 1 - 12 pc puzzle. 1 - 24 pc puzzle. This fun and challenging 48 piece jigsaw puzzle contains unique interlocking pieces made from recycled premium blue chipboard that makes for a sturdy feel and easy grip. U.S. Map Floor Puzzle: Take a trip around the United States of America on this vividly illustrated floor puzzle from Erica Kimball. 40 jumbo pieces form a 2 foot x 3 foot map for children ages 4 and up. As they're connecting the colorful shapes they'll also learn each state's capital as well as a little bit about what each state is known for. Note: the outline pictured on the box cover is the actual size of a puzzle piece but does not appear on the puzzle itself. Net Weight: 50 g (1.8 oz). 1 PCS Wooden Puzzles Learning Education Toys for Boys & Girls Ages 3 (Tortoise-W). - Net Weight: 50 g (1.8 oz). 1 PCS Wooden Puzzles Learning Education Toys for Boys & Girls Ages 3 (Fish-W). - Net Size: 15 cm x 15 cm x 0.5 cm (5.9" x 5.9" x 0.2"). - Net Weight: 50 g (1.8 oz). 1 PCS Wooden Puzzles Learning Education Toys for Boys & Girls Ages 3 (Bear-W-B). - Net Size: 15 cm x 15 cm x 0.5 cm (5.9" x 5.9" x 0.2"). - Net Weight: 50 g (1.8 oz). Four 12 piece jigsaw puzzles feature scenes from the classic books "Cat in the Hat", "Green Eggs and Ham", and "Hop on Pop". Stack and solve this 8 piece wooden jigsaw puzzle for 3D building fun! With classic Dr Seuss artwork on both sides, this puzzle is bound to be a hit with any Cat in the Hat lover. The puzzle stands on it's own for fun, storage and display. 20 PC JIGSAW WOOD PUZZLE. Fun shapes and colorful pieces make this puzzle the perfect starter for beginning puzzlers! Perfect for practicing matching and coordination skills. As well as learning colours. Jumbo Floor Puzzle. Ages 3 Years. Wood 'N Things. 48 Extra Large Pieces. Sturdy wooden storage boxes with see-through lids. 1 box of shaped wooden magnets--75 magnets in all! Handmade, hand cut, and hand painted mini Christmas tree jigsaw puzzle. Made in the USA, Gardnerville Nevada. Includes 4-12 piece puzzles in a wooden box with a lid. Puzzles include Elephant, lion, tiger, and zebra. All are complete and in nice clean condition. Color: Wooden-Color. - Material: Wood. Swap out his 6 Moody faces; Happy, Sad, Surprised, Sleeping, Worried or Angry; and create his outfit with shirt and pants pieces. Make up just the right story behind why he's feeling that way, or explore your own emotions and feelings. "DINOSAUR". WOODEN TRAY PUZZLE. exceed all U.S. toy testing standards. Item #: 997. Type: Wooden Puzzles. Number of Puzzles: 2. FastDrop Main Line. Sealed In Plastic. Made In China. FastDROP Main Line. Lodge Signs 500 Piece Jigsaw Puzzle. Get hiking with Springbok's "Lodge Signs" our 500 piece jigsaw puzzle. This collage of nostalgic wooden signs and camping paraphernalia will be sure to get you in the adventuring mood! Tetris Russian Block Wooden Puzzle Educational Toys for Boys & Girls Ages 3 (Tetris-W). - Material: Wood. -Weight: 210 g (7.4 oz). 20 PC JIGSAW WOOD PUZZLE. OWL AND BABY OWL. Fun shapes and colorful pieces make this puzzle the perfect starter for beginning puzzlers! Perfect for practicing matching and coordination skills. As well as learning colours. "PLAYFUL PETS ". WOODEN TRAY PUZZLE. No one is allergic to the lovable pets in this 12-piece wooden jigsaw puzzle! This is the ideal introduction to jigsaw solving.once the corner and edge pieces are in place, the puzzle is almost finished! 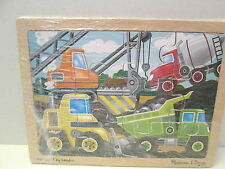 Thomas and friends 40 piece wood giant puzzle 24x18. Brand new in box. Look at pictures for what you will receive. Any questions, please ask before buying. 20 PC JIGSAW WOOD PUZZLE. Fun shapes and colorful pieces make this puzzle the perfect starter for beginning puzzlers! Perfect for practicing matching and coordination skills. As well as learning colors. Wooden Puzzles. Storage Box. 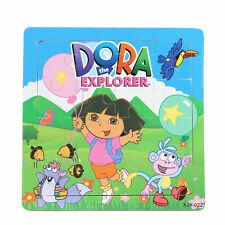 Features A Picture Under Each Puzzle Piece. Tyrannosaurus Rex. 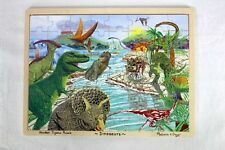 3D Dinosaur Puzzle. and improve your child's education. Known as the Lizard King. This sale is for a newDisney Pixar Incredibles 2 Set of 7 Wood Puzzles by Cardinal. This set is not sealed, but itis new and complete. The puzzle that was supposed to be on the front of the box under theshrink wrap was taken apart and put inside. 3D Dinosaur Puzzle. and improve your child's education. 9 POP OUT PIECES FOR THE BEGINNER. Known as the Three-Horned Face. Disney Pixar CARS- Set of 5 wood puzzles in a wooden storage box. Never used. Dinosaur puzzle. Gently used in box, light rubbing to box edges. Puzzle or Building Blocks. Number of pieces: 41. Disney Puzzles and tray fit neatly into storage box. 5 WOOD PUZZLES. Outside box is a little beat up but puzzle is in good condition. PUZZLE - JIGSAW MELISSA & DOUG "WILD ANIMALS" 4 PUZZLES WITH 12 PIECES EACH NIP! The puzzles include a tiger, a lion, an elephant and a zebra. Also included is a wooden storage box. This would be a great gift for a zoo lover! JIGSAW PUZZLES. 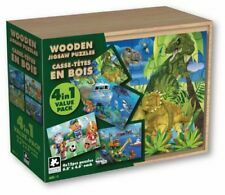 4 WOODEN PUZZLES - 12 PIECES EACH - #SX16130. Nickelodeon Teenage Mutant Ninja Turtles. 5 wood puzzles and tray. 2-12 piece puzzles. WOODEN JIGSAW PUZZLE 12 PC -ON THE FARM. 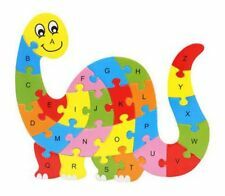 EXTRA : The colourful wooden puzzle pieces along the snail‘s shell show letters of the alphabet which need to be assembled in order to complete the puzzle. A nice, educational toy which encourages spelling.